I was stationed at NADC Johnsville from March 1960 to April 1963 and was in the US Navy and served as aircrew on most all of the many aircraft we had at that time. P2V-7s,WV-2, S2F, WF, SNB, R4D-6, R4D-8,A3D etc. Biggest project I remember was the beginnings of Project Tacamo a VLF transmitter in the Connie 131388 or was it 137889 ---I'm not sure now but it was one of those two. Letting out six miles of wire on an aircraft whose cruise altitude was about 25,000 Ft. sure gave you the willies. Here are some radio call signs that were given to me by Ken Harrison from AEEL while on a project flight on WV-2 137889 somewhere between Bermuda and the Azores. This is off of the original note paper that he wrote on during that flight. Ken was a civilian who kind of took me under his wing as a young newly married Navy guy. These are folks who were working at Johnsville or stationed at NJP. W3VGN LAUREL LANE OFF NORRISTOWN RD. Some of the aircraft that were there. This is not all of them but just some that I have in my memory. Perhaps Tom Smith can remember some of the others. I flew as Navigator, Radar, Radio and assisted with projects in flight. R4D-6 50802 Aircraft had been in Anarctic service before coming to NJP Had skis on when it first arrived. P2V-7 135554 affectionately called "Triple Nickel Four"
The attached photo is of the NEC-121K BuNo 131388 on the ramp at Johnsville in June 1964. I started work at NADC in June 1959, right out of college, working on passive airborne sonars (Project JEZEBEL, etc.). One job I had was overseeing the conversion of the Connie from a radar picket to a sonar research aircraft. (This because we needed a larger aircraft than a P2 for work on the development of DIFAR systems, and no P3's could be obtained for our work yet.) The biggest mod was the installation of a P3-A sono launch package in the waist of the aircraft. JEZ and other equipment stations replaced the radar consoles, and the height-finder radome in this picture also eventually came off. I did a lot of flying on P2V's before that time. LT Grover Yowell was the pilot on my first deloyment to VX-1 in Key West in 1960. He returned as CO of NADC years later as CAPT Yowell, and eventually retired with an Admiral's rank. In those early flights, Joe Gray was a great plane captain, 'Jonesy' was radioman, and now I can't think of the name of another nice crewman to work with, the radar operator who was really skinny. We used to live at 240 Roberts Ave. Horsham Twp. and still are very close friends with the family across the street at 237 Roberts Ave. They are the Pasquarellos and their daughter Michelle worked at NADC/NAWC just before it closed. We will be visiting them again in September. Thanks so much for the picture. This is one of the aircraft I spent so much time in. I have been wanting pictures of our birds ever since I got out of the Navy in 1963. We called her a WV-2 and the nomenclature changed to the NEC-121K after I left. The "Jonsey" you mention is AT-1 Claude Jones a WWII vet who was able to receive two messages at a time from a split headset and two radios. Totally amazed me. He really was a good guy. Story goes that he was in the Pacific and was a gunner in a SBD and was shot down once or maybe twice. Subsequent to that he had an opportunity to go to radio school and become an RM. He actually converted rates from RM to AT ( Radioman to Avionics Technician). He then served in PB-Ys and felt a lot safer. The tall skinny radarman could have been a guy named CPO Duffy who was originally at Johnsville as an AT-1 and returned as a chief. Or it could have been another guy named Bob Watts an AT-2. Comdr.. McDonald was the chief of flight operations. There was also a Comdr.. Reese who flew the Connies. My memory is rusty as I have not had the opportunity over the years to relive the many good, exciting experiences with others from NADC often enough. One of the many projects I flew on was known as "Tacamo" which was a VLF system to communicate with our SSNs in case the two VLF transmitters that were land based were knocked out. "Tacamo" was flown on WV-2 137889. We were flying out over the pond ( Atlantic ) mostly east of Bermuda. On one flight we were working with NASA's missile tracking radar ,at Wallops Station off of Chincoteague, and attempting to get a change in polarization of the antenna by flying in a tight circle. Flew in a circle so tight the number three engine on the starboard wing blew the PRT ( Power Return Turbine ) in the exhaust stack. We then had an in-flight engine fire. I was sitting at the Nav table across from radio and looked out the hatch to see nothing but flames. We dumped the fire bottles and they had no effect. We then dove to attempt to blow it out and exceeded the airframes max speed and should have lost the top radome but didn't. Prop wouldn't feather and things were looking glum. Finally we were now out of altitude and the aircraft couldn't remain airborne with the weight of the wire we had on board and only three engines. Comdr.. Reese thought we might have to ditch just off the beach at Chincoteague and so when he had commenced the dive he headed for the beach figuring to ditch as close to the beach as possible. The old Naval Air Station at Chincoteague's runway just about ended at the beach and Cmdr.Reese coaxed us over the sand and on to the runway. There was a crash crew with one truck which was there primarily for the one R4-D flight that came in each day from DC. They doused us with foam as we were rolling out and put the fire out. We evacuated the aircraft via ropes at the aft exit on the port side. The crew at the Wallops radar and our flight crew which was mixed military and civilian tried to drink the bar dry at Wallops that night. We were almost a catastrophe. We still referred to the Connie as the Willie Victor in our sonar ops, even with the nomenclature change. It was a very comfortable aircraft to work on. Certainly MUCH roomier than the P2-V's, and with those flexible wings it rode like a big old Buick. The stiff-winged P3's were a big contrast in any kind of turbulent air. Also, with so much room aboard, we never had to pre-ship anything to test op sites; the Connie served as its own freight service. We would even carry a ground-power unit aboard when working out of Nassau; we just needed fork-lift service to get it on and off. The biggest problem with the Connie seemed to be its engines. I don't know if this is true or not, but someone once told me that spare engines and parts were hard to come by because the same engines were used on Navy dirigibles, and when they took those out of service the engine support went too. 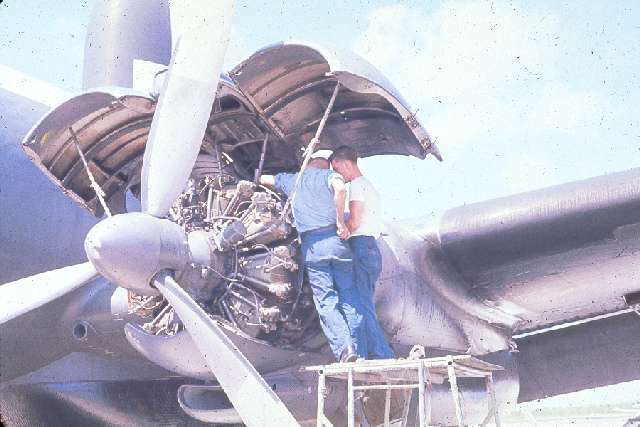 We had any number of flight cancellations and some in-flight failures, including one where we had to leave the Connie in Bermuda because it took so long to obtain a replacement engine after one had swallowed a valve on a project flight. That was an interesting landing all round: One prop feathered, low overcast over Kindley, getting low enough on fuel that the pilot didn't want to have to take a waveoff (this because we had burned up too much while they recycled the nose gear several times and could never get a down-and-locked indication on it), momentarily lost voice contact with GCA on final, and there were trenches dug along both sides of the runway for some kind of construction. But in general, the WV was a good workhorse that we used until we got access to P3's. Right! The radioman was Claude Jones and the radarman was Duffy. Both were really helpful and a pleasure to work with. On one deployment to Key West, Grover Yowell had borrowed a friend's power boat and we all got a crack at trying to water-ski. Some made it fine, some didn't; I felt like I was going to drown after several failed takeoffs. I remember that Duffy would give the high-sign that he was ready, but his ski-tips would dip below the surface before they hit the throttle. Every time, Duffy didn't seem to want to let go of the tow-bar, even though he was nothing but a lump of water trailing the boat. I heard that sometime later he was on a P2 landing in Brunswick, when the aircraft skidded and one of the props clipped an icy snowbank at the edge of the runway. Duffy was on the floor ditching station that backs up to the pilot, and a piece of one propeller blade came through the fusilage right above his head and killed the operator in the seat beside him. I understand that Duffy's nerves were shot by that experience. 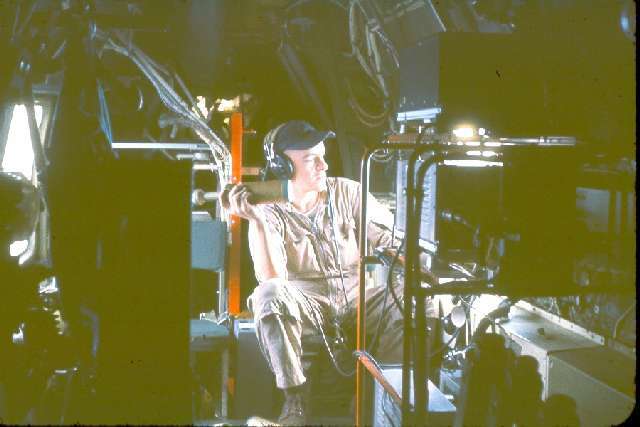 Somewhere in my vast collection of totally unorganized slides, I have some taken during our P-2V ops, including one of Jonsey at his station. If I can find some, I'll pass them along. I seem to remember side numbers such as 443, 985, and 554. I knew of TACAMO, but I don't have anything concerning the Connie before we got involved in adapting her to our work. I took these two pictures aboard the NADC P2V-7 #985 while working out of VX-1, Key West, about 1960-61. Radioman Claude Jones ("Jonsey") at the port-wing hatch (which is opposite his seat just aft of the wing-beam. AO Briggs waiting for the pilot's command to pitch a PDC explosive out the port waist window. One of my early jobs during aircraft project ops was to operate the project instrumentation tape recording system, which recorded all the sono receiver outputs. I had to put verbal time marks on the tape (long since replaced by time code generators), monitor tape recording levels, and change the tape when it ran out. 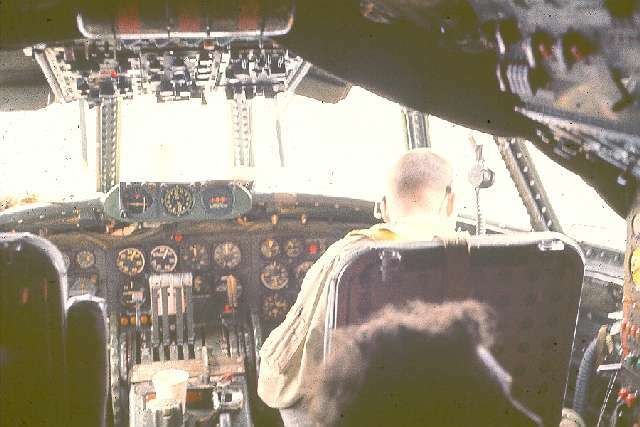 In the P2V's, the lab's Ampex instrumentation recording system was mounted on top of the wing spar, with the tape transport itself just forward of the radio operator's seat. The recorder operator's seat (my seat) was on top of the hydraulic reservour immediately forward of the wing spar. 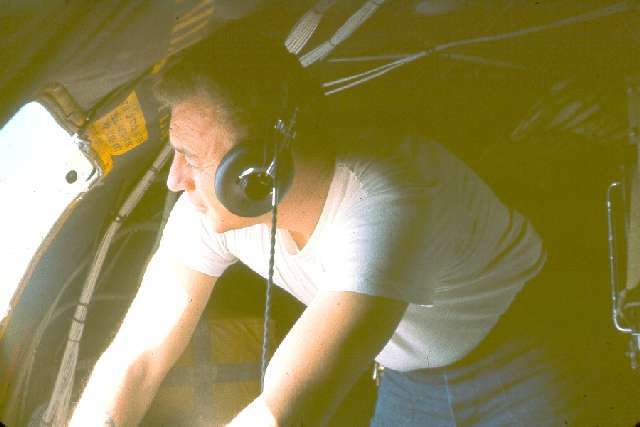 Changing tapes often meant waking up whichever crewmember was sleeping on the wing spar so that I could crawl over it to reach the tape unit. If you recall, one of the two relief tubes on the P2's was right by the hydraulic reservour (that spelling is not right). We were running ops in the middle of the night once, when the pilot came back to use the relief tube. First of all, he's practically standing in my face to use the cone-on-a-tube. Of course, with almost no light except the panel edge-lighting to see by, who knows what's going on. Next thing I know is that the pilot finds the relief tube is blocked, and hands me this brim-full cone to hold while he zips up. Yuk!! Later on, someone finds that the glass stand-pipe in the hydraulic reservour apparently got kicked in the darkness, breaking it, and there is hydraulic fluid all over the deck. Next concern was, is there enough hydraulic fluid left to operate the flaps and brakes on landing!! What a night!! Had you ever deployed to Key West? That was the site of many of my first deployments (1960+) and of my last (1997). I worked for a small contractor for a year after retirement, and one job got me a few shipboard tests out of the NAWC field station in KW as late as September a year ago. In many ways, Key West has experienced radical changes in the past 10-15 years. It was definitely a Navy town in the '60's. NAS Boca Chica was very active. Duval Street (Key West's "Main Street") was VERY quiet in the evenings then, especially during the week. Sloppy Joe's bar (Hemingway's old hangout) was appropriately dark and quiet, a good place to chill out over a few beers. Not so now!! Duval is now a Great White Way, alive with tourists from all over (ALL over!!) every night of the week, with shops, restaurants, bars chock full of bodies! Sloppy Joe's is alive, but so loud with music and crowds that it would be impossible to think, let alone talk. On my last deployment there, we left port on "Lesbian Prom Night" and returned two weeks later to "Biker's Weekend", when every Harley in FL was either parked on or running up and down Duval. NAS Boca Chica had nary an aircraft or other sign of life, and there was no guard at the gate to Trumbo Point Annex in KW proper, where the BOQ and NAWC's pier are located. Yet, KW is still fun to visit. And oddly, with all the radical changes in some places, the back neighborhoods seem to have changed not at all in 40+ years. The P2V shots were taken around 1960 or so. The JEZEBEL (Jezebel, the Betrayer) Program, concerned with passive airborne sonar for submarine detection, classification, and tracking, had developed the AN/AQA-3 and AN/AQA-4 airborne sonar processing/display systems by that time. In the 1960 period we were working on improvements to the associated sonobuoys; ocean tests were done out of Key West. When I started working at NADC in 1959, all the buoys used dry-cell batteries for power and had vacuum tubes in their electronics. Among other things, before we would use any buoys in air-drops, each one had to be disassembled in the lab, fresh batteries installed (and checked for noise, for some batteries were "noisy" and could not be used), the rf transmitter re-peaked (no crystal control of frequency yet), and pressure-tested for leaks once the buoy was fully reassembled. Also, before each flight, the sono receivers had to be re-peaked; again, no crystal control of frequency. I don't recall the specific buoy types from that era right this instant, but things in development included salt-water activated batteries to replace the dry-cells, and crystal-controlled buoy transmitters. Also, tubes were gradually replaced by transistor circuits. We would air-drop the buoys, run AQA grams and tape record the outputs in the aircraft, and often the buoys were then picked up by a recovery boat working out of Key West (where the NAWC-AD Key West Det is still active). We would then fly the used buoys back to NADC for evaluation of problems. Sensing, processing, and displaying omnidirectional acoustic spectra from individual sonobuoys, which yielded detection and classification information of targets, a function of the subs' machinery, props, and flow noise. That function was called LOFAR: LOw Frequency Analysis and Recording. Processing and displaying cross-correllated acoustic signals from pairs of omni sonobuoys, yielding bearing data on targets' broadband noise output (e. g., flow noise). That function was called CODAR: COrrellation Detection and Recording (or Ranging??). The bearing data from a single pair of buoys was ambiguous: you obtained an angle to the target relative to a line drawn through the two buoy positions, but the direction could be to the right or left of that line. So a second buoy pair was dropped at right angles to the first, their individual bearing data compared, and the 'correct' line of bearing thus determined. Still, this only yielded a line of bearing to the target. So the aircraft would go off a ways from the crossed-pairs of buoys and drop one more CODAR-pair. Although this pair's bearing data was also ambiguous, only one of its two lines of bearing would cross the line of bearing obtained from the other four buoys, yielding a specific location where the target was (you hoped). So six omni buoys and a fair amount of maneuvering were required to obtain a fix on the target. And since the exact spacing of the CODAR-pairs was critical to the accuracy of the bearing determinations, all the buoy drops were made at low altitude, and an "intervalometer" timer punched out the buoy-pairs based on the aircraft's ground-speed; all this was going on at 200 feet or so above the ocean. In the early 60's, the development of an improved sonar processing suite, the AN/AQA-5, began. This processor was destined for use in the new P3 ASW aircraft. Close on its heels, the development of DIFAR (DIrectional LOFAR) began, its processing suite designated the AN/AQA-7. A single sonobuoy of this type would be capable of providing acoustic information that could be processed to yield an unambiguous line-of-bearing to a target, using either discrete frequencies or broadband energy emitted by the target. Two such buoys would yield a position-fix. There was no criticality as to the spacing of those buoys. Incidentally, during its development, all the design and performance information about a sonobuoy was classified. Once introduced into the fleet, the buoy was declassified, because they were so easily picked up for analysis by the 'enemy'. All buoys have a scuttling device, either a salt-plug that eventually perforates or perhaps a burn-wire that punctures a flotation bag, causing the buoy to sink after its useful life is up, but in spite of this, many buoys have been known to have been recovered by others before this happened. The main display console being developed for the AN/AQA-5 (and the subsequent AN/AQA-7) was too big to even get through a P2V Neptune's hatch, let alone mount it anywhere in the aircraft. As mentioned above, the system was meant for fleet use in the newly arriving P3 Orions. NADC had no access to a P3 for development testing of the new processors at that time. So at first we got great cooperative support from the Canadians. They had the Argus, a huge 4-engine (recip) ASW aircraft that had a flight endurance in excess of 24-hours, and eight bunks because they flew with two full flight crews. We flew test ops with the Canadians out of Summerside, Prince Edward Island, Canada; Bermuda; and Key West. Along about this time (early 60's), we got NAVAIR support to modify a Super Constellation radar picket aircraft, already at NADC, to our sonar testing needs. A full P3-A sonobuoy launcher package was obtained and adapted for installation in the waist section of the Connie. This called for a major reworking of that part of the aircraft's frame, all done by NADC's aircraft installations group. We installed operator's stations for an AQA-4 and an AQA-5, as well as for instrumentation tape recorders, sonobuoy receivers, project communications radios, and other test equipment. The NEC-121K BuNo 131388, or as it continued to be known by an older designation, WV-2 (the "Willie Victor"), served as NADC's primary sonar research aircraft for several years. Eventually, P3-A 148883, the first P3 Orion built for the Navy, was transferred from Pax River to Navy Johnsville. It and other P3's to follow became the Center's test aircraft, and the Connie was retired from use. There was once another sister aircraft to this Connie at NADC. Sometime in the early 50's it was coming in for a landing at NADC, approaching from the south end, descending through a very low overcast. When they broke through the overcast, the pilot saw that although he was on the heading of the runway, he was a little offset to one side. He tried to slip the aircraft over, but one wing hit the ground and the aircraft cartwheeled. Dan Rosso (his cousin is Chuck Rosso, another NADC engineer), who was our sponsor at NAVAIR in the 60's and 70's, was working at NADC at this time and saw the crash because he was walking over to the airstation side. He told me how the plane rolled, loosing both wings in the process, and ending up upside-down. He said he saw one crewman jump out of the wreck and run "the full length of the runway" to get away from a possible explosion. There is an ET from NADC, a short fellow named Harry (I can't think of his last name right now, but I could find out) who has copies of 8x10 B&W Navy photos (he showed them to me) taken at the wreck scene, with foam all over everything, engines, wheel assemblies, etc., all over the place. There were 17 crewmen on board that plane when it crashed. One received an ankle injury; broken or something. That was the only significant injury. 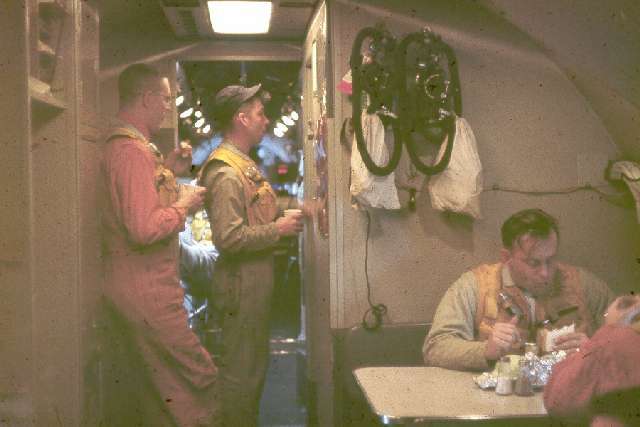 In the mid-60's when we were testing DIFAR performance in Hawaii aboard P-3s from VX-1/Key West, one of the crew informed me that our copilot on the flight in progress had been the pilot on that ill-fated Connie. Umm--- thanks for that bit of encouraging information. I first reported to NAS Johnsville Jan. 1959 departed for the USS kitty Hawk Sept.1960,while being built at Camden NJ. During that time I got flight time on P2V-7 Triple nickel 4, I do remember a couple of these fellows mentioned but not many as I was in the preservation crew at the time. I left the Kitty Hawk in Nov.63 and returned to NAF Johnsville until June 67. One story I'll pass along that proved to be embarrassing for the CONNIE crew is as follows: I believe it was in the spring of 66 or 67 when the Connie(388) went roaring down the runway when no.3 Eng..wasn't developing power and thus flt was aborted, the a/c was parked just off the closed taxi way adjacent to the tower. Jerry Connor and I worked nights and were instructed not to work on the plane as the crew would take care of it,ok! Curtis Wright reps. were called in, hoses and gauges were connected to the engine nose section and a lot of other things were tried over the course of the week or so,in the end what was discovered was a very large amount of grass packed into the "master control"(CARB).put there by the ever present starlings(birds),strange though that Connor and my suggestion of the birds were laughed at. I was a USN Air Traffic Controller at Warminster from 1975-1977. I have some flight line pictures from that era. I will send them to you in an upcoming e-mail. By the way, was the Intrepid Crusader really an A7 Corsair?